Pre-order now to experience the beautiful music of I AM SETSUNA with an exclusive digital track 'The warmth of hope' by composer Tomoki Miyoshi. This is the story of Setsuna; a young woman of incredible inner strength and the sacrifice she must make to save the people of her land. The Island had a custom. To maintain peace, once a decade, a sacrifice was offered to a fiend on the island. However, one year, the fiend grew violent before the next sacrifice was due. Those living on the island were afraid and tried to calm the fiend by offering a sacrifice; Setsuna, chosen because of her powers of enchantment. Setsuna must leave with her guards for the farthest land, where the ceremony of sacrifice will be held. 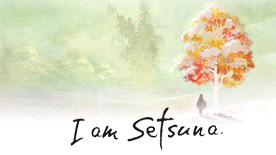 I AM SETSUNA, SQUARE ENIX, and the SQUARE ENIX logo are registered trademarks of the Square Enix Holdings Co., Ltd.